Here's a place where I can post my thoughts on new papers, provide updates on my projects, and post info that will eventually be on my website The Theropod Database - http://theropoddatabase.com/ . It will center on theropods, but may delve into other topics as well such as phylogenetics. In another ornithischian abstract, Borinder et al. redescribe the hadrosaur Tanius. As the authors state, it's been 86 years since the genus was described. The only known specimen is immature and has a flexor canal on the femur. Unfortunately, it emerges in a big polytomy with other taxa just outside Hadrosauridae. I do wonder if excluding some of these nine taxa a posteriori might show some resolution between the remaining ones and Tanius. 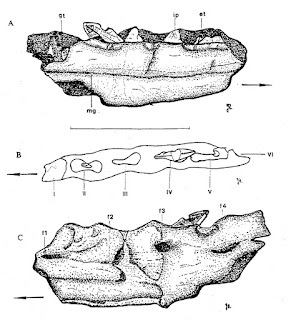 Cranial elements of Tanius sinensis holotype (after Wiman, 1929). Cuesta et al. argue that the ulnar bumps of Concavenator are homologous to the secondary remix attachment points of birds. This was disputed separately by Naish and myself shortly after the genus was described. I still don't see how the authors interpret the bumps as posterolateral instead of anterolateral. I argued the structure was an intermuscular line between the flexor ulnaris and the extensor carpi radialis brevis (sensu Meers, 2003), or flexor digitorum profundus and extensor carpi ulnaris (sensu Gishlick, 2002). Cuesta et al. state that (besides the triceps brachii which we both agree is back on the olecranon) they reconstructed the anconeus and abductor polices longus and that the bumps are not located between them. The abductor polices longus (pronator quadratus in Meers) is a more proximodorsally located scar I agree has nothing to do with the bumps. I think anconeus is another term for the extensor carpi ulnaris, based on Gishlick's figure of Corvus and Hudson and Lanzillotti's (1964) description. So with the caveats that there seems to be no consensus for muscle names or homology between crocodylians and birds, I don't think Cuesta et al. had the same muscles in mind as I did. Fortner reports "parts of an associated postcranial skeleton of a small theropod dinosaur recently collected from the uppermost Aguja Formation." This is another frustrating example of the information-bereft abstract, with the first twelve lines devoted to introduction and background knowledge. The only other bit of information is- "The specimen exhibits some unique features, but is compatible with identification as either Troodontidae or Dromaeosauridae." This is very intriguing, as while both eudromaeosaur and troodontine teeth are known from the Aguja, we have Richardoestesia and Paronychodon from there too. As I think these are microraptorine and basal troodontid respectively, this specimen could fit the bill. Did anyone get more details? 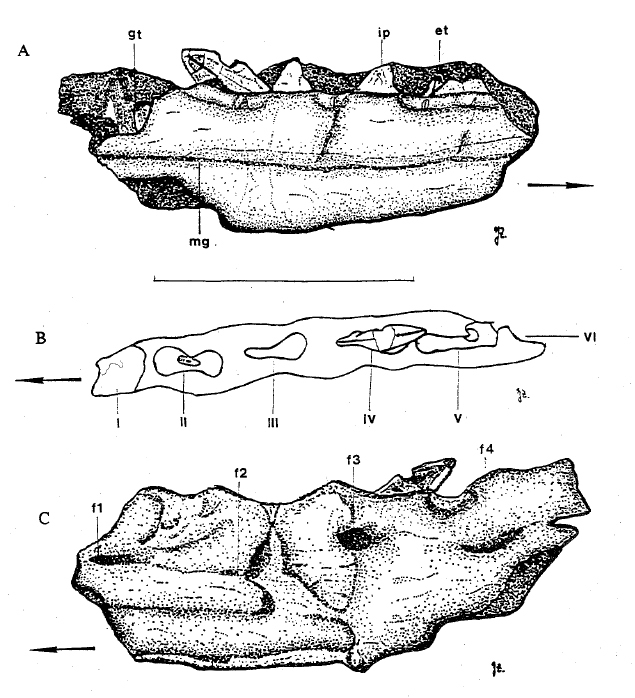 The only published non-dental remains attributed to Paronychodon- a partial dentary IPFUB GUI D 1 in A. medial, B. dorsal, and C. lateral views (after Zinke and Rauhut, 1994). It does differ from later Paronychodon in having distal and sometimes mesial serrations. Harding et al. have the non-dinosaurian abstract I think could be most important to dinosaur studies. They examined all "published characters for discriminating Sceloporus from the related iguanian lizards Uta and Urosaurus, and for discriminating among species of Sceloporus" for 14 species, "11 of [which] had more than ten individual skeletal specimens, and for four of them sample sizes exceeded 50 specimens." Perhaps astonishingly "almost all characters published in the literature to identify fossil specimens have no power to discriminate reliably between Uta, Urosaurus, and Sceloporus, nor between species of Sceloporus we examined." In our field where most species are only known from single specimens, and most known from multiple specimens don't have more than one or two described in detail, what does this mean for our autapomorphy lists? Holtz et al. report more information on an Anzu specimen (anyone know the collection number?) they announced last year. Interestingly, only distal tarsal IV is fused to the unfused metatarsus, and "a pair of pronounced cruciate ridges on the plantar surface of metatarsal III" are present as in Elmisaurus but don't extend as far proximally. This would make it intermediate in pedal morphology between Chirostenotes and Elmisaurus. Maddin et al. present a hypothesis based on the development of skull roof bones in mice and chickens. In mice (and axolotls) the suture between the frontal and parietal corresponds to the boundary between the neural crest and mesoderm in the embryo. In chickens, the latter embryonic boundary is within the frontal itself. Thus the authors suggest the avian 'frontal' is actually a fused frontal and parietal, while the avian 'parietal' is actually a postparietal. They say that hypothesis "is also supported phylogenetically where data from the fossil record reveal separate frontal, parietal, and postparietal bones are present in all stem lineages of extant taxa, including that of birds (e.g., the stem archosaur Euparkeria)." The problem I see is that the postparietal in basal archosauriforms is a tiny wedge between the parietals and supraoccipital, while the parietals have the same topological relationships and morphology in these basal archosauriforms that they do in basal dinosaurs. It seems more likely to me that this is a case like manual homology where the developmental process itself evolves, so that somewhere on the sauropsid line, the neural crest-mesoderm boundary moved into the frontal. Also interesting would be to know what the state in lepidosaurs and crocodylians is. Comparison of skull roof in dorsal view of- left, Erythrosuchus africanus (after Gow, 2003); center, Ornithosuchus longidens (after Walker, 1964), and right, Herrerasaurus ischigualastensis (after Sereno and Novas, 1993). Parietal is blue, postparietal is red. Maddin et al. suggest the red at left is homologous to the blue at right. Mannion et al. 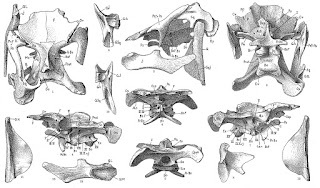 redescribe the famous 'French Bothriospondylus' (MNHN coll. ), presumably based on Moine's (1999) thesis. It's great that we're getting all of the historical Bothriospondylus material redescribed in the last decade. McFeeters et al. do the important job of reevaluating Struthiomimus specimens. Little known to most, the holotype is extremely fragmentary, with most information coming from Osborn's AMNH 5339, Nicholls and Russell's UCMZ 1980.1 and the new RTMP 90.26.1. The authors find "a relatively small partial skeleton from the lower Dinosaur Park Formation" (which based on listed elements must be ROM 1970) to belong to a new taxon of ornithomimid based on several autapomorphies. This specimen forms the basis of the dorsal snout in Russel's (1972) and Paul's (1988) cranial reconstructions, making those composites. Another specimen shares some pelvic characters with Qiupalong, perhaps relating to a Dinosaur Park astragalus reported by McFeeters et al. in last year's SVP abstract. Nesbitt et al. seem set to provide a detailed description of Asilisaurus, after the original tabloid announcement. Interestingly, Agnosphitys is said to a basal silesaurid as well, which is the fourth proposed identification for the genus. Add this to Agnolin's (2015) Jornadas Argentinas abstract proposing Pisanosaurus belongs to the clade, and its membership is expanding markedly. We also get yet another description of Nothronychus' braincase. Far be it for me to complain about having too many descriptions of a taxon, but this one specimen of one taxon was described in 2005, 2012 and 2013, and now we'll probably get a fourth portion next year or so. At least this new abstract is about the previously unrecognized anterior portion, but I'd rather have that time and effort go towards... say "Zunityrannus" or describing the Bayan Shiree therizinosaur postcrania. Smith et al. report that "there is a supraorbital evagination in this specimen that is currently interpreted as accommodating a well-developed nasal gland in the frontal. This development has been observed in some other archosaurs, especially marine birds, where it is associated with salt excretion and is consistent with a beach or other evaporitic paleoenvironmental interpretation." So let's all start our All Yesterdays style marine therizinosaur pics. Finally for this year, Sullivan et al. report a 'sphenosuchian' specimen sister to Junggarsuchus. This has the interesting mix of cursorial features with a webbed hand and distal tail sheathed with armor. References- Wiman, 1929. Die Kreide-Dinosaurier aus Shantung. Palaeontologia Sinica (series C). 6, 1-67. Hudson and Lanzillotti, 1964. Muscles of the pectoral limb in galliform birds. The American Midland Naturalist. 71(1), 1-113. Walker, 1964. Triassic reptiles from the Elgin area: Ornithosuchus and the origin of carnosaurs. Philosophical Transactions of the Royal Society of London, seies B. 248(744), 53-134. Russell, 1972. Ostrich dinosaurs from the Late Cretaceous of western Canada. Canadian Journal of Earth Sciences. 9, 375-402. Paul, 1988. Predatory Dinosaurs of the World. Simon & Schuster: New York. 464 pp. Sereno and Novas, 1993. The skull and neck of the basal theropod Herrerasaurus ischigualastensis. Journal of Vertebrate Paleontology. 13, 451-476. Zinke and Rauhut, 1994. Small theropods (Dinosauria, Saurischia) from the Upper Jurassic and Lower Cretaceous of the Iberian Peninsula. Berliner Geowissenschaftliche Abhandlungen. E 13, 163-177. Jura, France). MS thesis, Memoires de Maıtrise Magistere Sciences de la Terre ENS-Lyon. Gishlick, 2002. The functional morphology of the forelimb of Deinonychus antirrhopus and its importance for the origin of avian flight. PhD thesis, Yale University. 142 pp. Gower, 2003. Osteology of the early archosaurian reptile Erythrosuchus africanus Broom. Annals of the South African Museum. 110(1), 1-88. Meers, 2003. Crocodylian forelimb musculature and its relevance to Archosauria. The Anatomical Record. Part A, 274A, 891-916. Agnolin, 2015. Nuevas observaciones sobre Pisanosaurus mertii Casamiquela, 1967 (Dinosauriformes) y sus implicancias taxonomicas. XXIX Jornadas Argentinas de Paleontologia de Vertebrados. Libros de Resumenes. 13-14. With respect to what Agnolin says about Pisanosaurus, we shouldn't rule out the possibility that the odd mix of cranial ornithischian features and basal dinosauriform features in Pisanosaurus is because PVL 2577 itself is a juvenile. Yet the features noted aren't ones we see in juvenile ornithischians- ankylothecodonty and a closed acetabulum for example. This was emphasized in the talk, and is the reason for referring Agnosphitys to the clade. Pisanosaurus was not mentioned. Hopefully the Pisanosaurus holotype has been cleaned up. When I last saw it it was a dark mass of old consolidant and hair. I am not surprised at all, of course, if it is discovered to fall outside of Dinosauria. I know I saw one abstract in the pdf somewhere that in an off comment said that they found Yutyrannus as a proceratosaurid. Did anyone else see this? Brusatte et al.'s. Also that the Bissekty tyrannosauroid is sister to Xiongguanlong. How likely is that conclusion? Having a 9m Proceratosaurid in China would certainly be unexpected. Sinotyrannus was ~9-10 meters long and has always been identified as a Chinese proceratosaurid. The very first paper on Sinotyrannus did not consider it a proceratosaurid (the family was not named until the following year), but rather a possible tyrannosaurid. With respect to the McFeeters et al. abstract regarding Struthiomimus, it is interesting to note that the newly described ornithomimid Tototlmimus (Serrano-Branas et al. 2016) raises the question of whether the one Struthiomimus specimen reported as distinct from Struthiomimus by McFeeters et al. could be similar to Tototlmimus. Claudia Inés Serrano-Brañas, Esperanza Torres-Rodríguez, Paola Carolina Reyes-Luna, Ixchel González-Ramírez and Carlos González-Leóne (2016). "A new ornithomimid dinosaur from the Upper Cretaceous Packard Shale Formation (Cabullona Group) Sonora, México". Cretaceous Research 58:49-62. doi:10.1016/j.cretres.2015.08.013. No, none of the characters that diagnose Tototlmimus are present in that specimen. The paper is out. "2016" is a lie, even if the journal itself perpetrates it (several do). Cite it as "2015 (printed 2016)" if you really must. ...However, the name Tototlmimus has not yet been validly published. The pdf lacks any trace of evidence that it has been registered in ZooBank; such evidence is required for valid electronic publication. Tototlmimus Serrano-Brañas, Torres-Rodríguez, Reyes-Luna, González-Ramírez & González-Leóne, 2016, in Serrano-Brañas, Torres-Rodríguez, Reyes-Luna, González-Ramírez & González-Leóne, 2015. What an annoying citation that will be. I'm an amateur paleontologist with a BS in Earth and Space Sciences from the University of Washington. My scientific interests center around theropods and phylogenetics.